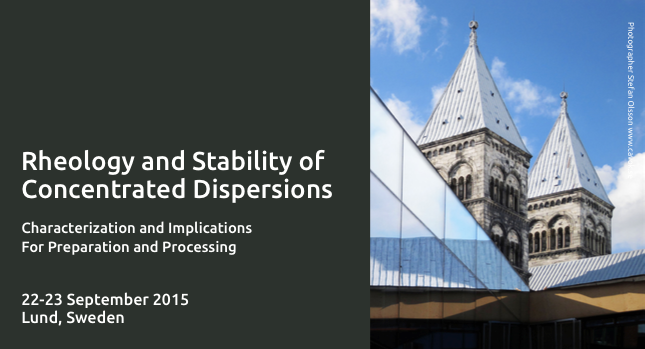 Characterization and Implications For Preparation and Processing 22-23 September 2015 in Lund, Sweden. This two-day course is focused on dispersed systems and covers both theoretical and practical aspects of products based on concentrated dispersions. The course is directed to Research Scientists and CMC managers, as well as to senior laboratory technicians . Our experience is that it is valuable if you take the course as a group, adding your different perspectives on the common problems of your project. Course Fee: EUR 1690, reduced rate EUR 1500 for two or more enrollments from the same company at the same time for the same course. VAT will be added for applicants domicile in Sweden. will be sent to the address stated above. Cancelations must be made no later than August 21st 2015 for a full refund.